In the Rider-Waite Tarot deck, the two of wands shows an image of a tall man standing on the roof of a castle and looking out to sea. In one hand he holds a globe and in the other he holds a staff - and to the other side of him, a staff is planted firmly in the ground. He is adorned in gowns and wears a red hat giving the impression that he has some kind of importance or authority. In a general reading, the Two of Wands Tarot card meaning suggests that there is a need for balance or that you are about to find balance in life. It may be that you are about to embark on a new venture and that you need to make sure you keep that balance any way you can. A Two of Wands Tarot card reading reminds us to be wary of finding a perfect equilibrium in anything we do, or that if things are feeling out of balance, that we need to be aware of it and make changes. If we are already trying to make adjustments in our life to find balance, it also reassures us that things are about to improve because of this. It encourages us to keep our focus on the end result and to stay positive. The Two of Wands card upright in a relationship reading reassures you that there is about to be more of a feeling of equality or an even give and take between you. If you feel that one of you does not give as much as the other, the Two of Wands card upright suggests that you address this situation in your relationship. If you are single and looking for new love, it signifies that you may already know the person that you are about to become romantically involved with. It indicates that you should give someone a chance and get to know them more, before you tell them you are not interested. You may be pleasantly surprised at how successful this relationship could be. If work has felt like a struggle recently, the Two of Wands card upright signifies that your hard efforts are about to pay off. Work is going to become more enjoyable, run more smoothly and you will feel far more content in your career. If you are looking for new employment, the Two of Wands reassures you that you can apply for jobs, or attend interviews with confidence. It reminds you not to let others get in your way, but to accept any given support and encouragement. This is a positive card in terms of working or career life and no matter how you are feeling right now, it shows you are actually well-respected and thought of highly. If you are looking for spiritual guidance and the Two of Wands upright card is centre focus of your reading, it indicates that there currently is, or is about to be – a spiritual connection and partnership with another person. This person will be an important part of your life or could be very beneficial to know. This card also reminds us that we must make time for ourselves, look after our health, spiritual wellbeing and emotional needs. If we do this then we are giving ourselves as much balance as possible, thus connecting us more securely to our spiritual self. Intuition and psychic awareness will be advantaged if we have a greater balance and connection. GENERAL READING: The Two of Wands card reversed in a general reading suggests that you need to remember to put situations in perspective. Often worries and fears can emphasise events in our minds. LOVE READING: When the Two of Wands appears as reversed in a love reading, you can expect your relationship to reach a deeper level of intensity and understanding, perhaps with an offer of commitment. If you’re looking for love, an unexpected new love is very soon coming your way. WORK READING: The Two of Wands card reversed in a work reading signifies that a happy surprise is soon to happen, possibly a job offer or a promotion. If you are thinking of moving jobs, then it suggests you move on but try not to leave on a negative note. SPIRITUAL READING: The Two of Wands reversed in a spiritual reading implies that you give yourself some rest and relaxation, pampering or space to yourself which will do you good. Are you unsure of whether you want to move jobs, or are you single and hoping to meet someone soon? Speak to the UK’s most gifted Tarot readers, Psychics, Clairvoyants and Mediums at TheCircle. 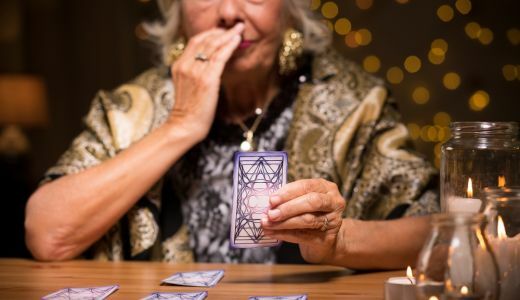 Tarot readings combined with expert psychic skills, give you very good detailed advice and insight to current situations and your future.